This is a rich lamb dish from northern India that's perfect for Diwali. It's scented with almonds and cardamom, and steeped in plenty of creamy sauce. 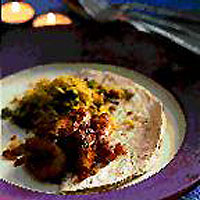 Serve with plain Basmati rice and a vegetable dish of your choice such as Waitrose Vegetable Thali. To make the curry paste, place the garlic, onion, chillies and almonds in a blender, add a little water and process to a fine paste. Set aside. Melt the butter in a pan, add the whole cardamom pods and the cinnamon stick, and stir over a medium heat for 15 seconds to release the flavours. Add the curry paste and cook gently for 5 minutes - stirring from time to time so that the paste doesn't stick to the bottom of the pan. Stir in the lamb and cook over a medium heat until lightly browned. Add the yogurt, salt and sufficient water to just cover the meat. Stir, then cover and simmer gently for 45 minutes, stirring occasionally. Increase the heat, add the cream and stir while bringing to the boil. Stir in the crushed cardamom seeds and white pepper to taste. Garnish with coriander leaves.